Duraline Imaging Inc., a packager of remanufactured laser toner cartridges, realized it had a problem when its slow-moving production line kept it from landing a major new client. Based upon the recommendation of others in the toner industry and with the assistance of Solid Design, a local Vac-U-Max representative, a vacuum conveying system by Vac-U-Max of Belleville, N3 coupled with an automated filling machine provided by Allfill of Exton, PA quickly reestablished Duraline's position in the marketplace. Duraline's major hurdle in its quest for a greater share of the market was the performance of its packaging system. Because filling cartridges with laser toner is the company's staple business, the first aim was to streamline the production process. Toner has a fine particle size, and as a result, is difficult to work with. Drifting dust and spills are always problems with loading toner cartridges. Typically, toner would arrive at the company's facility in small, premeasured bottles. The bottles were then emptied by hand into the toner cartridges. This was an inefficient, messy and tedious task. To improve the operation of the company Tom Dunn, Duraline President opted to purchased an auger filler machine from Allfill which would discharge the material accurately, with excellent repeatability and would be much faster than by hand. Dunn's next problem was how to load this new filler with the toner. Hand loading was as messy and hap hazard as his original problem. 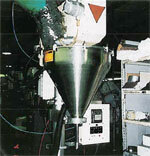 The solution for the loading problem was a vacuum conveying system from Vac-U-Max. The Vacuum conveying system draws the 3pm toner from drums at floor level, a distance of 10 vertical feet, into a unique flared tube receiver, then discharges it into the filling machine automatically, according to the demand set by the level control in the filler. A special internal dust filter prevents the toner from leaving the vacuum receiver during transfer. The filter is cleaned during each discharge cycle using a unique shaking method which ensures a clean dust filter while maintaining its efficiency. A Vac-U-Max single jet venturi power unit which uses a modest amount of plant compressed air supplies power for the conveyor to create the vacuum and airflow for conveying. 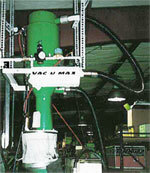 "The speed of production is great," says Dunn about Vac-U-Max's conveying system and Allfill's filling unit. "Waste and drift is reduced. Setup and cleanup time has also improved." With the new system, Duraline can buy toner in bulk quantities and cut nearly 25 percent off its raw material costs. Buying toner in bulk saves "a couple thousand dollars a month in material costs alone," plant manger Alan Stepp said. Labor costs are also down. According to Stepp, operating the Vac-U-Max conveyor cuts two to three hours a day in operating costs, or nearly $6,000 per year. Duraline reports that with its new conveyor and filling system, it can meet the demands of potential customers. This was something the company could not always count on with the old filling system. Today, Duraline is able to handle customer production needs while ensuring a safe work environment for its employees.